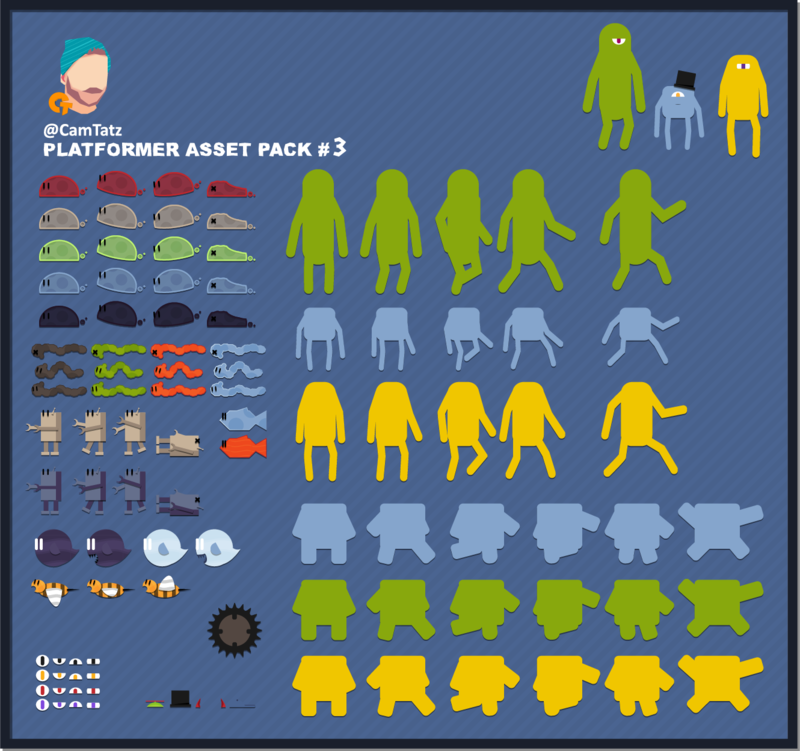 This is Platformer Asset Pack 3! 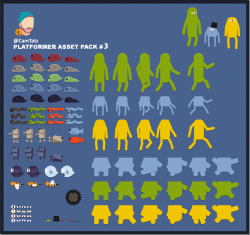 A suplementary pack to the Free Platformer set. 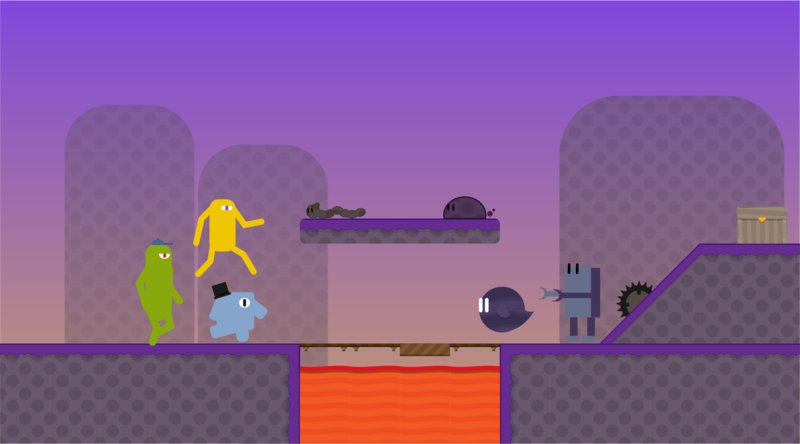 This weeks version adds some enemies and player models! Use some of the cosmetic items such as hats and eyes to enhance and individualize the animated pieces. Please comment and let me know your thoughts! Next weeks pack will be User Interface based! So Buttons, Boxes, Sliders, Cursors, Bars and more fun coming next week. If you like please Favorite! Thank you again and see you next week! Great character models, definitely going to be useful for future projects. I really love your art style, this is a great pack! Although I have to wonder why you chose not to make the asset resolutions a power of 2. Having inconsistent resolutions for spritesheets makes for a somewhat difficult experience when importing for use in Unreal Engine. If only your blocks were 256x256 instead of 208x208! Nonetheless, I really enjoy your work. Great job! Good Point, everything is made using a 100x100px box in Illustrator and then exported to png with 300dpi. In a few more weeks I'll probably release everything again in a much bigger standardized pack and I will make sure that the rasterized files will be consistant (although they still should be now) and in a standard res of ^2 (which they are not atm). Thanks for the response. You are truly awesome and I really appreciate the effort. Your art is a great source of creativity for practicing my game design skills. Hey Kenney! Absolutely love your stuff and you did inspire me to help out the community. We definitely need more of it. I don't understand how the taller green sprite animation is supposed to flow for its walking animation. What's the order? Oh, btw: Could you change your assets to have a single sprite sheet (kinda like the preview one), but so that all sprites are on one sheet, and it is possible to have the sprites in pieces in case we want to make our own animations? Just a suggestion, you could include a white/grayscale version of any sprites that might come in different flavors, because you can tint them programatically to any color. This gives more flexibility to a sprite, and uses fewer assets. Hi. I love this pack so much, and thanks for making it. 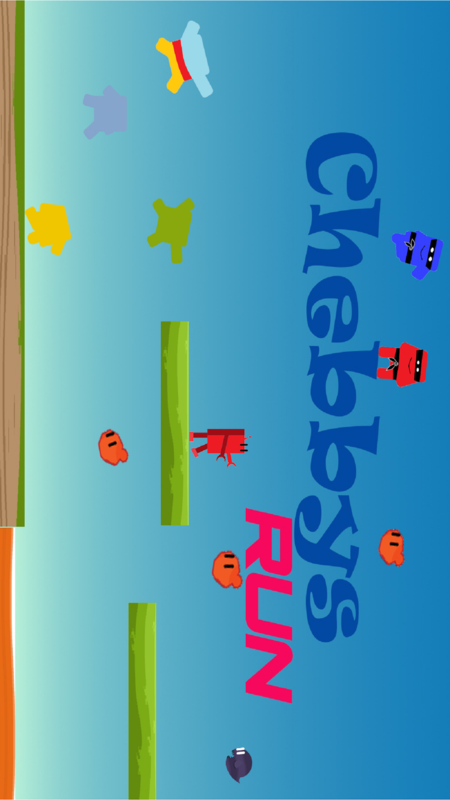 Its only on App Store, and its name is Chebbys Run. right now i am waiting for review for version 1.2 of the game, but 1.1 is out now. Hope you will enjoy it and once again, thanks for making this possible. Óla estarei utilizando o pacote! Muito obrigado!